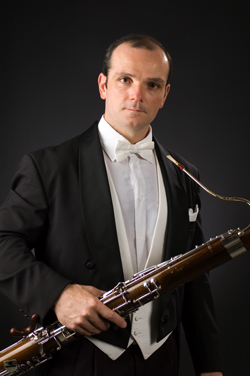 In the fall of 2001 Valentin Martchev started his collaboration with San Diego Symphony as acting principal bassoonist, and became the tenured principal bassoonist under Maestro Jahja Ling in 2004. In February 2007 he performed John Williams’ bassoon concerto Five Sacred Trees with the San Diego Symphony, to critical acclaim. The San Diego Tribune reviewed “...Small wonder that Martchev received an enthusiastic outpouring of cheers and applause. John Williams’ concerto made this bassoonist a star.” Martchev has also performed in the Mainly Mozart Festival and La Jolla Summerfest. Previous professional affiliations include performing as principal bassoon of the Shira International Symphony Orchestra in Jerusalem, Israel and the Charlottesville Symphony in Virginia as well as performing in the Bulgarian Radio State Orchestra. Additionally, Valentin has participated in a number of prestigious festivals including Aspen, Tanglewood, Music Academy of the West, and Marlboro Music Festivals. Martchev’s teachers included Nancy Goeres, principal bassoonist of the Pittsburgh Symphony, Yordan Metodiev, and Tony Komitoff.